'The Howth Collection' - 50 traditional Irish tunes inspired by the environs of Howth peninsula. 'The Howth Collection' is a set of fifty traditional Irish tunes inspired by the environs of Howth peninsula. Howth lies just north of Dublin city, (forming the northern portion of Dublin bay), and many artists, including William Butler Yeats, James Joyce and Sir William Orpen have drawn inspiration from the locale for their own work. A single trip to this vibrant and enchanted place will make it immediately apparent why. Howth boasts some of the most stunningly beautiful scenery in the country. It is rich in wildlife, history and tradition, including a lively trad music scene that has been ongoing in Howth village for decades. This original collection of tunes comprises of jigs, reels, marches, polkas and airs. 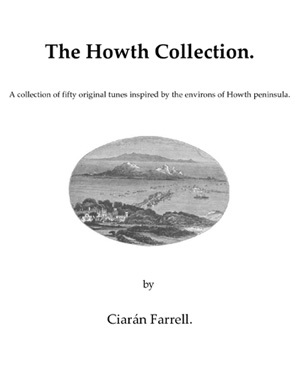 'The Howth Collection' is available from the Irish Traditional Music Archive.